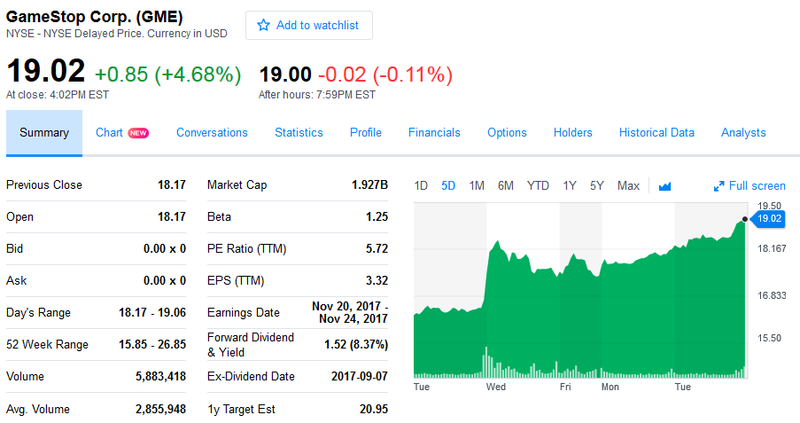 GameStop's stock price has gone up by over 15% since November 21, BEFORE Black Friday. Of course, they need to maintain that momentum by not closing their stores. I don't know what that last game is, but it's clearly not garbage like ARMS. I did tell people to go buy a Nintendo Switch BEFORE the holidays, though, when it was very plentiful. Thanksgiving begins “the holidays.” There weren't any deals on the Nintendo Switch hardware for Black Friday or anything like that, so it doesn't actually make sense to me why people would buy the Nintendo Switch just now and not months before. ...At least fidget spinners weren't on the list of hot-selling items. Ludwig didn't even get anything on Thanksgiving, Black Friday, or Cyber Monday. ...Though he wanted to. There's a purchasing horror story that might get to KoopaTV this week, depending on when and how it's resolved. Stay tuned to KoopaTV! While you are staying tuned, why not leave some comments on your thoughts on GameStop's profits over family values? ...Did you ever accept that they had family values? Are you proud of Nintendo's selling success? Ludwig's purchasing horror story arrived a whole two weeks later, because it wasn't resolved until then. I don't get it, if there weren't any deals on the switch for Black Friday, why even say that if they close on that day, they'll lose profit to some other retailer? It's stupid to even think that the switch will be on sale. (It's still new) I personally don't like shopping at GameStop, I rather go to Walmart/Target/ToysRUs. Also, OF COURSE I'M PROUD THE SWITCH IS TURNING OUT TO BE SUCCESSFUL! Nintendo finally started promoting the right way. I finally see ads on YouTube for the Switch. I NEVER saw an ad on the Wii U. If it weren't for me seeing it at Walmart, I wouldn't of had known it existed. I'm also happy that they are having more variety in games and not just "exclusive to Nintendo" games. Just because there weren't any deals, doesn't mean that it wasn't on sale. The Switch's sales success is in spite of there being no deals. In other words, people were willing to pay full price with no bundles or discounts just because they really want a Switch. For whatever reason, people went out in droves to buy the Switch on a discount-dedicated day even though it had no discounts, as opposed to buying the Switch in the many days it's been available prior to last week. GameStop had a sense this would happen, so they had to stay open. If GameStop was closed on Black Friday, then all of the sales from the Switch's BEST-SELLING PRODUCT, PERIOD status that would go to GameStop would instead go to Walmart/Target/ToysRUs. For whatever reason, the culture considers Thanksgiving to be Black Friday Eve instead of, you know, Thanksgiving. ...By the way, welcome to KoopaTV's comments section. Hope to see you more, along the lines of your November 29 mornin' comments than the late-night November 28 one. ...Though, if you could stop dumping ASCII art that'd be nice. People have to scroll through this comments section after all. The bear one is nice and small though, but I don't associate teddy bears with warmth. I heard Target's 3-foot giant plush bear sold well on Black Friday. You owe me a bear Luddy! Another aid to this is the "Buy 2 Get 1 Frer" deal on preowned games and accessories that GameStop did, so while there's no deal on the Nintendo Switch, there certainly were some on its accompanied software (and the Pro Controller, but I survived eight months without it, so...). Exactly. I even tried to take advantage of that with my insider hook up and find some pre-owned switch games. Didn't pan out. Turns out most people who work for Gamestop end up hating it. They mentioned on the earnings call that they don't expect the Switch to contribute to the pre-owned part of the business until sometime in 2018, because there hasn't been enough time for it to be pre-owned yet. "Are you proud of Nintendo's selling success?" I guess it's a good thing that Nintendo isn't going bankrupt any time soon. However - and I hate to be the grain of salt to spoil the soup (is that a saying?) - the Switch is still pretty limited on titles and pretty much all of the worthwhile titles are developed by Nintendo themselves. Although the Switch tries to bring more 3rd party games than the Wii U, its ultimately a though battle, since the hardware differences with the "classical" consoles. I recently read, that Indie games are doing very well on the Switch. While this seems like a positive thing at first glance, it also shows the lack of games for the switch: Indie games have an easier time selling there because there is less competition from non-indie games. So without me winning the lottery I can't see me buying a console for 300+ bucks, only to play my favourite Nintendo franchises. And after 3 consoles I still can't get to like motion controls (I just don't really want to move when playing video games) nor hand-heldibility (I frankly think it's a gimmick, like 3D was and VR is). And to completely sound like a bitter old man: Back in my day, when you wanted to bring a console with you, you grabbed it and brought it to your friends house. https://i.imgur.com/zhqmZqR.jpg Pic related, it's me some years ago. After 3 consoles, using gyro controls feels very natural and intuitive. You're not moving your body around or anything. It allows for mouse-like precision, especially for something like Splatoon, that isn't available on a traditional controller. We made a big deal about the GameCube's handle back with the Switch's big January presentation, believe me. In the first 6 minutes of it. You still have to grab the Switch and carry it, since you can't fit it in your pocket or anything. You're right on indies excelling due to lack of competition. It was like that in the Wii U's first year, too. Nintendo NY was closed on Thanksgiving so at least we know Nintendo has some family values. Easy decision for Nintendo, since unlike GameStop's stores, Nintendo NY is a marketing front and not a direct revenue generator. "What the hell is a Hatchimal, a Colleggtible, or a PJ Mask?" A a parent they are the latest children fad but at least they have more substance than a fidget spinner. Hatchimal is a plush toy cracking out of a plastic egg and you can then take care of the plush. PJ Mask is a Disney Jr. show meant to be an educational show. How educational, I am not sure. They usually are just TV babysitters in reality. Are Hatchimals and Colleggtibles the same product line? So is it... a pajama mask you can wear and keep warm? I am sure there will be different toy fads once my child is old enough to want to beg mommy for a toy. Wot, no toys besides Splatoon plushies until they get old enough to beg for themselves? Atleast I dont write about fake news. You don't write about fake news, but you do write fake news. So does he write fake news or not? Your comment is sending mixed signals. ...Uh, no, the signals of my comment are very clear. I even used italics. 87.5% of his articles are fake news. All 1 of your articles is FAKE NEWS. The entire article was actually 100% truth...? You said Wendy and I are the same person, which is factually incorrect. You've done absolutely no research on the topic and literally just made it up. One read of the KoopaTV About Page would tell you as much. If you had access to our Discord server, which you won't get, it's also really obvious we're different people. She's always playing Steam games and I'm not, since my computer can't even run that stuff. At least Charssie is not racist. I'm not even sure if this "discord server" is real. Also you're clearly the same person. We've had several reaction logs in Discord already, and several people have me friended on Discord to privately chat with me. How would this log, which features myself, Wendy, Rawk, Vortex, and Kamek all at the same time, be possible? Those logs could have been from some other site. You and Wendy are still one and the same. "Sign up for free to find a farmer, rancher, cowboy, cowgirl or animal lover"
I don't use Farmers Only. Never have. ...Might in the future. Does Farmers Only have a group chat? Are you saying everyone on our staff are farmers? Rawk couldn't farm if his life depended on it, believe me. I still don't know your actual basis for why you think Wendy and I are the same person. We have much different personalities and we have traceably different online existences. I forgot my reasoning actually. I bought 2 DVDs, a long sleeve shirt, and a 2 piece set of mittens and a beanie on Black Friday in the afternoon for a total of about $24. I was not planning on going anywhere but my mother asked me to pick up cat litter for her from PetSmart since it was on sale. I decided since I was out that I might as well look around. So were those pets' clothing? The clothing is for myself. I bought them after I went to PetSmart. Although some people buy clothing for their pets, I do not considering they stay inside most of the day. I'll read that to mean that you don't wear clothes while inside.